Woodchucks survive late rally defeat Border Cats, 5-4. Wausau, WIS – The Wisconsin Woodchucks took a three run lead into the ninth inning and the Thunder Bay Border Cats came … "Full Story"
A crucial base-running mistake that resulted in two outs squashed a potential Woodchucks’ rally in the top of the third inning, and starting … "Full Story"
A base hit to right field by Kenosha left fielder Pat Porter that was mishandled by Woodchucks’ right fielder Kevin Connolly allowed the … "Full Story"
Woodchucks’ first baseman Jake Scudder’s third inning grand slam proved to be the game-winning hit in Sunday’s doubleheader finale, as the Chucks completed … "Full Story"
A dominant performance on the mound from southpaw Kaylor Chafin and five RBIs from third baseman Paul DeJong led the Woodchucks to a … "Full Story"
Woodchucks’ rally not enough to defeat Loggers, lose 10-7. Wausau, WIS – The Wisconsin Woodchucks used a seven-run seventh inning to take the lead against the La Crosse Loggers, but the … "Full Story"
Woodchucks struggle to find strike zone fall to Loggers, 8-2. Wausau, WIS – The Wisconsin Woodchucks dropped the first game of the series against the La Crosse 8-2, as the Woodchucks’ pitching … "Full Story"
Homeruns from Woodchucks’ catcher Zach Arnold, shortstop Ryan Howard and two from first baseman Brendon Hayden, including a grand slam, highlighted the Woodchucks’ … "Full Story"
Woodchucks flip the script on Rafters, 4-3. 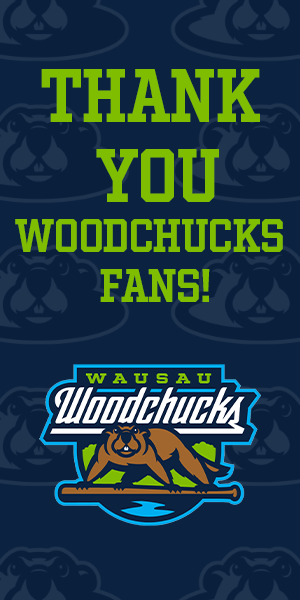 Wausau, WIS – For majority of the game it was the Wisconsin Woodchucks’ pitching that struggled to find the strike zone, but … "Full Story"
The Woodchucks along with MPPL Financial and Channel 9 WAOW will be hosting the Central Wisconsin Baseball Hall of Fame Ceremony on … "Full Story"